I remember the morning in November 1978 when it was broadcast on the radio that Norah Trott had been murdered. 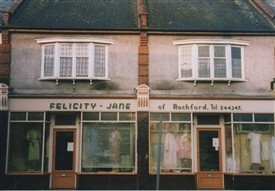 No one could believe that in the quiet little town of Rochford, such a thing could happen. But happen it did. Her body was found in Ship Lane. She had been battered to death. This led to a huge police presence in the town. Police knocked on doors and fingerprinted hundreds of men over the age of 18. They were searching for a tall thin man who had been seen running from the vicinity. Norah Trott was a well know figure in the town, and she lived above her old-fashioned dress shop in North Street. The police were convinced they knew the identity of the killer, but despite finger-tip searches of the Ship Lane area and interviewing hundreds of residents, the killer was not found. It was twenty years later that an anonymous letter sent to the police caused them to reopen the case. The murderer was finally found, arrested and convicted of the crime. This page was added by Mave Sipple on 27/08/2012.